Whether coming from Mobile itself, or nearby cities like New Orleans, Montgomery or Biloxi, then you’re likely wonder where you can park for your cruise. Fortunately, it isn’t difficult to find a spot for your cruise. In fact, the port makes it pretty simple. The cruise port is located at the edge of downtown and right on the river, so land is at a premium. That means you are stuck with parking at the port itself. The good news is that Mobile’s terminal parking is extremely convenient. Parking is right on-site at the port, located at: 201 South Water Street Mobile, Alabama 36602. As you can see from the map below, the lot is adjoined to the terminal, so there isn’t a long walk to the ship. This makes it extremely easy for those with mobility issues or other difficulties getting from a distant lot to the terminal. There are approximately 500 parking spaces in the garage. If more room is needed, there is an overflow lot located at the Mobile Civic Center. Parking at the Mobile cruise terminal runs $18 per day. So for a 5-day trip, expect to shell out $90. That’s not the cheapest port parking around the country, but considering that many other ports charge $20 or more per day, it’s not bad. If you have an oversized vehicle like an RV, the rate jumps to $36 per day. That is extremely high for any port in the country. We suggest finding an alternate way to the port if you are in an RV. You can pay with cash or credit card. Reservations aren’t required as there is no danger of running out of parking spaces. Simply show up on cruise day. Given the port’s location within the city, there aren’t many alternatives around. If you do want to park somewhere for cheaper, however, look into hotel cruise parking. 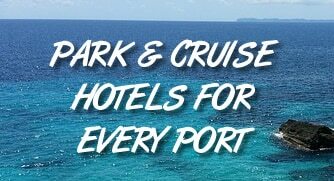 If you are in the area and plan to stay a night anyway, then the cruise and park packages mean that you pay a little more for your room, but they let you keep your car at the hotel during the trip and offer you transportation to and from the port. For a list of Mobile hotels offering cruise parking, check out this page. And ridiculously expensive! Way more than New Orleans. This site must be owned by or operated for the port parking! Let’s see what TripAdvisor or CruiseCritic say about this! Not sure what the issue is. Parking is currently $18 at the port. It’s relatively expensive compared to similar ports. For instance, Galveston is about $10 per day. But there aren’t a lot of other options unless you try a hotel with a parking package.